The experts agree – in 1981, Napa Valley was named California’s first AVA. During the early years of winemaking in the Napa Valley, vineyards were often planted in patchwork patterns with many varieties growing side by side, as the practice of matching the most appropriate grape varieties to the particular soil and climatic conditions of a vineyard site was little understood at best. As Napa Valley became better known, vintners decided to market our wines collectively to distinguish them from and compare them to the wines of the great wine regions of the world. Today, we have an intimate understanding of the connection between terroir and vine and have realized just how the diversity of Napa Valley’s soil, climate and terrain allow us to grow distinctive wines from specific areas within the valley. This great diversity has led our vintners and growers to petition the government to create defined grape growing areas within Napa Valley, giving them names that reflect their regional designations. These areas are called American Viticultural Areas, or AVAs. The Napa Valley is itself an AVA, and it has been since it received its own designation in 1981. It is California's first recognized AVA and the second in the United States. Within the Napa Valley AVA exist 16 nested AVAs, including: Atlas Peak, Calistoga, Chiles Valley District, Coombsville, Diamond Mountain District, Howell Mountain, Los Carneros, Mt. Veeder, Oak Knoll District of Napa Valley, Oakville, Rutherford, St. Helena, Spring Mountain District, Stags Leap District, Yountville and Wild Horse Valley. Elevation: 760 to 2600 feet(232 to 792 m). Principal varieties & characteristics: Cabernet Sauvignon: Bright berry and cherry fruit, and more acidity than wines from Stags Leap District. Chardonnay: Crisp, floral, aromatic, with distinctive pear-mineral flavors and bright acidity. Climate: Warm to hot, depending upon time of year. Daytime summer temperaturesmay peak above 100° (38°C) adn fall to low 40s°(6°C) at night due to cool afternoon and evening breezes drawn in from the Chalk Hill Gap from the Pacific. Climate: Fairly warmer summer days (mid-80°F plus/28.8 to 31°C), but due to higher elevation and summer fog at night, quite chilly at night (below 50°F/10°C). With colder winters and spring, as well as strong winds, harvest comes later than on valley floor at Oakville. Elevation: 600 to 1200 feet (182 to 366 m). Rainfall: 35 inches (88 cm) annually. Principal varieties & characteristics: Cabernet Sauvignon, Merlot, Cabernet Franc & Zinfandel: Cabernets usually reveal a lush yet firm texture with good acidity, firm tannin and distinctive cherry-blackberry flavors. Merlot typically has vibrant black cherry flavors mixed with a touch of cocoa. Climate: Weather is moderated by its proximity to the San Pablo Bay. Daily average high temperatures can be as much as 10 degrees cooler during the hot months than most other AVAs, and heat spikes tend to be less severe. Climate: Moderately warm temperatures with lower maximum temperatures and higher minimum temperatures than the valley floor, due to topography and altitude. 50 to 90°F in growing season (10 to 32°C). Rainfall: 40 to 55 inches (135 cm) annually. Principal varieties & characteristics: Cabernet Sauvignon, Cabernet Franc: firmly structured, rich and fairly tannic when young, with strong blackcurrant, mineral, and cedary flavors. Less supple and fleshy than valley or benchland wines, with good aging potential. Rainfall: 40 to 50 inches (125 cm) annually. Rainfall: Lowest in Napa Valley: up to 24 inches (10 cm) annually. Principal varieties & characteristics: Chardonnay: minerally pear-apple and spice flavors. Merlot: sinewy and lightly herbal, with fine tannins and sleek structure. Pinot Noir: ripe cherry-cinnamon spice flavors with earthy notes. Climate: Moderate to cool: marine air and fog can remain until late-morning. Late afternoon breezes frequently occur, maintaining slightly cooler temperatures than upper valley. Mid-summer temperatures may reach 92° F (33°C) and drop to around 50°F (10°C) at night. Rainfall: 36 inches (90 cm) annually. Principal varieties & characteristics: Merlot, Chardonnay, Cabernet Sauvignon, Sauvignon Blanc and Riesling. Merlot and Cabernet Sauvignon benefit from a longer growing season with slightly cooler temperature, though crop size is typically less than in other AVAs. Elegant style is the common theme with fruit flavors of cassis, tobacco and spice typical to Bordeaux-style reds. Chardonnay showcases flavors of crisp apple, mineral notes and tropical fruit with fine acidity. Climate: Moderately warm, with temperatures commonly in the mid-90°F (34-35.5°C) range in high summer, but also still strongly affected by night and early morning fog, which helps keep acidity levels good. East side of the AVA receives warmer afternoon sun. Elevation: 130 - 1000 feet (40 to 305 m). Principal varieties & characteristics: Cabernet Sauvignon, Cabernet Franc and Merlot: Ripe currant and mint flavors, rich texture and full, firm structure tempered by rich fruit. Sauvignon Blanc: Full, steely, yet very fleshy. Climate: Moderately warm, still marginally influenced by early morning fog. Western bench area is cooler, with less late afternoon sun, tempered by afternoon marine winds. (This AVA averages a bit warmer than Oakville and Stags Leap District). Usual summer peak temperatures are mid-90°F (34-35.5°C) with a large diurnal range. Elevation: 155 to 500 feet (47 to 152 m). Principal varieties & characteristics: Cabernet Sauvignon, Merlot, Cabernet Franc, Zinfandel: Quite intense cherry and mineral, almost earthy aromas. Flavors are full, ripe, and notably currant with firm, but supple tannins for extended aging. Also produces Sauvignon Blanc. Climate: Cool to moderate depending on elevation and aspect. Most vineyards sit above the fog line, providing wrmer nights and cooler days than the valley floor. typical mid-summer high temperatures reach 85° (29°C). Elevation: 600 to 2600 feet (183 to 792 m). Principal varieties & characteristics: Cabernet Sauvignon, Cabernet Franc, Merlot, Zinfandel: Powerful, firm, blackberry-currant flavors and often richly tannic, with excellent acidity for aging. Chardonnay: Sinewy, firm and not as fruity as those of the valley floor, revealing more citrus and stone fruit flavors. Climate: Warm, due to greater protection from western hills, with less fog or wind incursions. This narrowest part of the Napa Valley floor floor provides more heat reflection off the hillsides. Mid-summer temperature peak is often in tmid-to-high 90°s (35° to 37°C). Elevation: 200 to 475 feet (46 to 145 m). Rainfall: 38 to 40 inches (95 to 101 cm) annually. Principal varieties and characteristics: Cabernet Sauvignon, Cabernet Franc, Merlot: deep, ripe, often jammy flavors, with firm tannins for structure and acid for long cellaring. Appealing aromas of currant and black fruit. Syrah: Fleshy, supple and slightly earthy. Zinfandel: Blackberry-like, well-structured. Sauvignon Blanc, fresh and forward, passion fruit and lemon, crisp and fresh, not "grassy". Climate: Moderately warm with afternoon marine winds acting as an "air-conditioner" to cool the warmer air radiating off the bare rocks of Stags Leap itself and the surrounding hillsides. Mid-summer temperatures can reach 100°F (37.7°C), but more regularly are in mid-90° range (34° to 36°C). Elevation: Sea level to 400 feet (20 to 123 m). Rainfall: 30 inches (75 cm) annually. Soils: Volcanic gravel-loams on the floor of the valley, with rocky hillsides, and low to moderate fertility due to hard clay subsoils. Principal varieties & characteristics: Cabernet Sauvignon, Merlot: Distinguished by lush, velvety textures and fine perfumed cherry and red berry flavors, supported by soft tannins. Sauvignon Blanc: Round and ripe, yet retains excellent citrus and apple flavors. Climate: Due to elevation and prximity to San Pablo Bay, it is the coolest of all the Napa Valley AVAs. The air mass that passes over Carneros cools another 10 degrees by the time it rises to the AVA..
Elevation: 850 to 2130 feet (259 to 650 m). Principal varieties & characteristics: Pinot Noir: Bright berry and cherry fruit with great acidity. Chardonnay: Crisp, floral, aromatic, with distinctive pear-mineral flavors and bright acidity. Climate: Moderate, with cool marine influence and fog contributing to cool summer mornings and the strong breezes of San Pablo Bay keeping afternoons more comfortable than further up valley. Mid-summer peak temperatures may reach low90°F (33°C), with noticeable diurnal fluctuation to the mid-50°F range (13°C). Elevation: 20 to 200 feet(6 to 61 m). 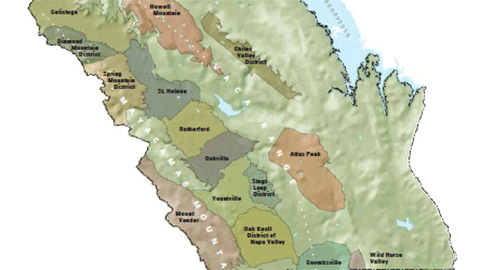 Download a high resolution map of the Napa Valley Appellation and its Sub-Appellations.